Sweep or move grain, rubbish, sand, gravel, rocks, glass, plastic, cans, metal swarf, dirt, dust, sawdust, snow and mud, leaf debris and many other materials. 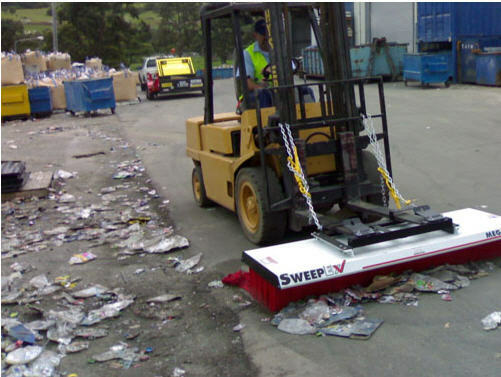 Sweep materials such as plastic shrink wrap and welding wire which cannot be swept with rotary brooms or vacuum sweepers. 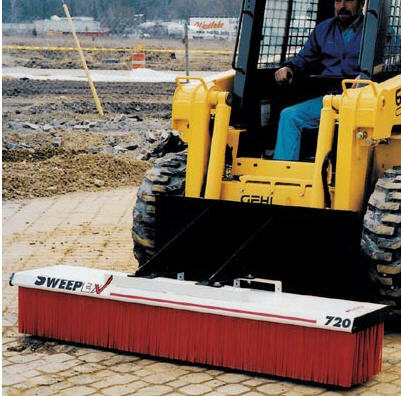 Pre-sweep larger debris before using your mechanical sweeper. Suitable for applications in every industry including farming, agriculture, grain handling, waste, recycling, concrete, construction, demolition, landscaping, plastics, mining, sandblasting, etc. Light to medium duty industrial sweeping jobs. Five rows of tough polypropylene bristles. Available in 1200mm and 1500mm lengths to suit most light applications. Solid air craft grade aluminium, one piece extrusion. Proven to cut cleaning time by more than 90%. Economical, practical and better than former methods. Will sweep sand, gravel, grain, glass, sawdust, mud, light snow, rubbish, plastic shrinkwrap, wire and standing water. Sweeps best in forward direction. Brushes require no maintenance or servicing. Replacement bristles easy and quick to fit. Complete with ‘Quik-Tite’ forklift mount. 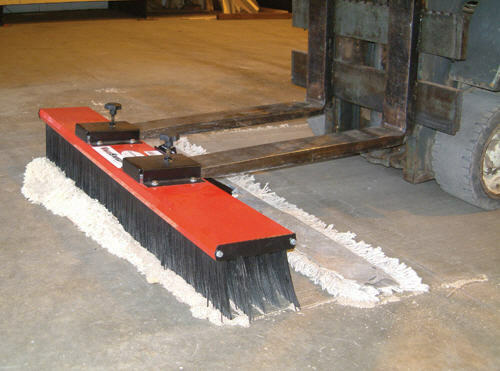 Suitable for heavy duty industrial sweeping jobs. Available in either 1500mm or 1800mm lengths to get big jobs done fast. Eight rows of tough polypropylene bristles. Solid steel frame, fully powder coated, welded bristle channels. Economical, practical and better than manual methods. A fraction of the cost of ownership and maintainence of a mechanical sweeper. Sweeps in any direction – forward or reverse. Brush life estimate well over 800 km’s. Heavy duty for indoor or outdoor use. Available in either 1800mm or 2400mm lengths to get big jobs done fast. Eleven rows of tough polypropylene bristles. 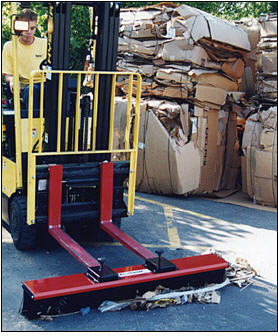 A fraction of the cost of ownership and maintenance of a mechanical sweeper. Complete with standard forklift mount.